The Delta Moving Average displays a moving average of the difference between the two given inputs over a given range of bars (Delta Range). The formula for this is as follows: Moving Average (input1-input2[d], n) where input[d] is the input value of a bar d bars ago. The Delta Moving Average (Delta MA) is used to see small changes in the direction of the moving average curve on the price chart, which is normally difficult to see. (Delta is the fourth letter of the Greek alphabet and signifies a very small change). Delta MA helps to give traders a heads up to a trend change from long to short or short to long. In the EUR/USD chart above, the Delta MA is plotted as a histogram below the price chart and for illustration purposes, the moving average used on the chart is the 10-period SMA, to correspond to the SMA used in the indicator calculation. TRENDS: The first step is to look for signs that a market is trending or about to trend. This can be done by looking at the fundamentals and focusing on markets that are starting to move. Create a watch list. After deciding that a stock sector, currency grouping or commodity is about to trend, then use the Delta MA indicator to join the trend. In the EUR/USD Daily Chart above, the trend is up, starting with a market reversal on January 3, 2017 from a low price of 1.03405, when most of the market participants were looking for parity. The histogram of the Delta MA reflects the changes in the SMAs on the price chart. When the SMA is moving up, so too is the histogram. When the SMA heads down, the Delta MA moves down incrementally, as it reflects small changes in the SMA. When price corrects down, the Delta MA peaks and heads down to below the zero line. In this uptrend, a buy signal occurs where the Delta MA crosses back above the zero line, as noted by the four vertical blue lines in the EUR/USD chart. Another way of saying this, is when the SMA slope is down on the price chart, the histogram peaks and green becomes red when it crosses below the zero line. When the SMA slope turns up, the Delta MA signals a buy when it crosses above the zero line. Please note that this is purely one observation I had when I studied this indicator on trends. There are other uses for it as well. For example, during a sideways market, the indicator can be used as a straight oscillator to buy and sell at oversold and overbought levels. Also, this oscillator will produce divergences at market tops and bottoms. Experiment and back test the indicator if you plan to use it. 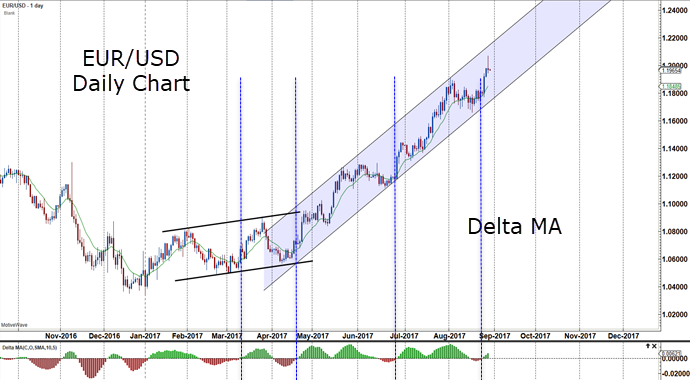 Learn how the Delta MA helps put traders in the trend as it is progressing. Start incorporating the Delta MA indicator into your chart set-up. Finally, use the Delta MA indicator in developing trading strategies with other indicators. This entry was posted in Trading Tips and tagged day trading, Delta MA, market analysis, trading, trading strategy, trading system.